Our Dec. 1928 meeting was held at Mrs. CS George Mrs and M Kerney lead the devotionals, reading us the facts of the comming and birth of Christ reports of the Instute were given, prizes for County schools for essies were allowed [$5.00?] 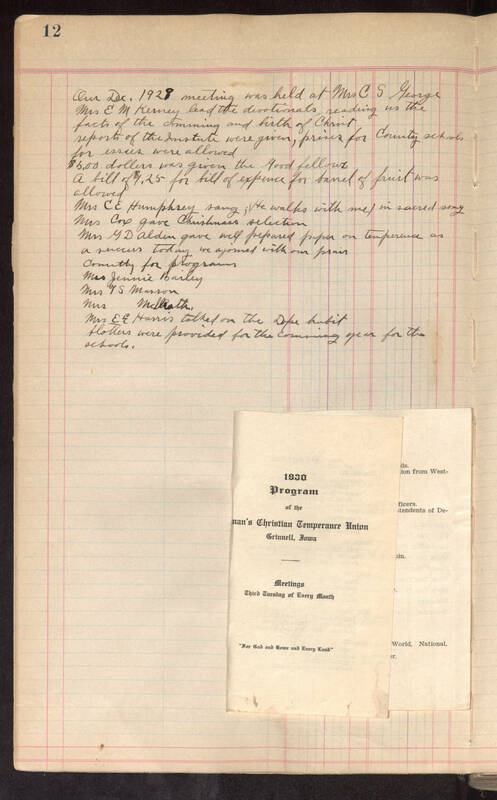 dollars were given the Good Fellows A bill of $1.25 for bill of expence for barrel of fruit was allowed Mrs CE Humphrey sang; he walks with me in sacred song Mrs "[Coe?]" gave Christmass selection Mrs G D Alden gave well prepared paper on temperance as a success. today we "[ajorned?]" with our prair Comitty for program Mrs Jennie Bailey Mrs T S Masson Mrs "[Mcllrath?]" Mrs EE Harris talked on the dope habit blotters were provided for the comming year for the schools. 1930 Program of the Woman's Christian Temperance Union Grinnell, Iowa Meetings Third Tuesday of Every Month "For God and Home and Every Land"